CLEVELAND, Nov. 1, 2017 /PRNewswire/ -- Manufacturers looking to take their content marketing to the next level can learn a lot from other companies that are further along with their content marketing approach. 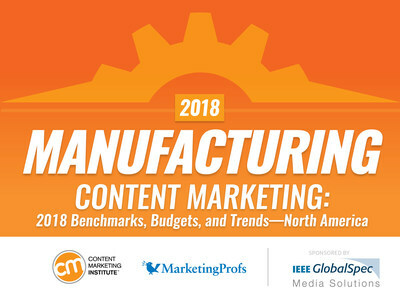 That's one of the key findings in the Manufacturing Content Marketing 2018: Benchmarks, Budgets, and Trends—North America report just released by Content Marketing Institute (CMI). The report is sponsored by IEEE GlobalSpec Media Solutions. Nearly half of respondents (46%) said their organization is in the young/first steps phase of content marketing maturity; 30% are in the adolescent phase; and 22% are in the sophisticated/mature phase. Those who are further along in maturity report a stronger commitment to content marketing, are more likely to have a documented content marketing strategy, and do several other things differently than those in the young/first steps phase. "As a marketer, you may think there isn't much you can do to change your program's content marketing maturity – that it simply takes time," says Lisa Murton Beets, research director, Content Marketing Institute. "However, content marketing maturity doesn't necessarily depend on how long a company has had a content marketing approach. A skilled team can move the dial forward quickly; however, that's not likely to happen without a strong commitment to content marketing. And while it's true that commitment can strengthen based on results over time, how can you move forward if your organization isn't strongly committed in the first place?" Manufacturers in the sophisticated/mature phase of content marketing maturity are 5.6 times more likely than those in the young/first steps to report their organization is extremely/very committed to content marketing (73% vs. 13%). 55% of manufacturing marketers surveyed characterize their organization's overall content marketing approach as "moderately" successful. Reported success is higher among those in the sophisticated/mature phase (33% of whom characterize their approach as "extremely" or "very" successful). 56% of manufacturing marketers surveyed said their organization's overall content marketing approach is "much more" or "somewhat more" successful compared with one year ago. 58% of manufacturing marketers surveyed outsource at least one content marketing activity, with content creation being the most frequently cited (49%). The processes involved with content creation are an issue for manufacturing marketers: 20% report the project flow within their organization as excellent/very good; 31% rate it as good; and 49% rate it as fair or poor. Content Marketing Institute is the leading global content marketing education and training organization, teaching enterprise brands how to attract and retain customers through compelling, multichannel storytelling. CMI's Content Marketing World event, the largest content marketing-focused event, is held every September in Cleveland, Ohio, USA, and the Intelligent Content Conference event is held every spring. CMI publishes the bi-monthly magazine Chief Content Officer, and provides strategic consulting and content marketing research for some of the best-known brands in the world. Watch this video to learn more about CMI. Content Marketing Institute is organised by UBM plc. UBM is the largest pure-play B2B Events organiser in the world. Our 3,750+ people, based in more than 20 countries, serve more than 50 different sectors. Our deep knowledge and passion for these sectors allow us to create valuable experiences which enable our customers to succeed. Please visit www.ubm.com for the latest news and information about UBM.